Naftogaz has paid for 45.6 million cubic meters of gas which is enough to cover consumption for 5 days, according to Gazprom spokesperson Sergey Kupriyanov. “Naftogaz has made a prepayment of $15 million for March gas supplies. Gazprom has received the sum into its payment account. This sum covers some 45.6 million cubic meters of gas, which is enough only for 5 days,” Kupriyanov said. Currently Ukraine is accepting 10 million cubic meters of gas daily, Kupriyanov explained. Ukraine made a similar $15 million gas prepayment at the end of February. On Wednesday, Ukraine Energy Minister Vladimir Demchishin said the country will be making “small” prepayments this month. The prepayment terms are a key requirement in the so-called ‘winter gas package’ agreed by Russia, Ukraine and the EU in October last year. It means that Kiev needs to pay in advance for the Russian gas it’s going to consume. This term was included to the contract after a row over late payments by Ukraine. In June Gazprom cut supplies to Ukraine because of a “chronic” failure to pay, but resumed supplies after six months. Currently Ukraine owes Russia $2.4 billion for gas, according to Russian Energy Minister Aleksandr Novak. In this latest gas row Ukraine has been accusing Russia’s Gazprom of breaking the contract, saying it supplied less gas than Kiev asked for. 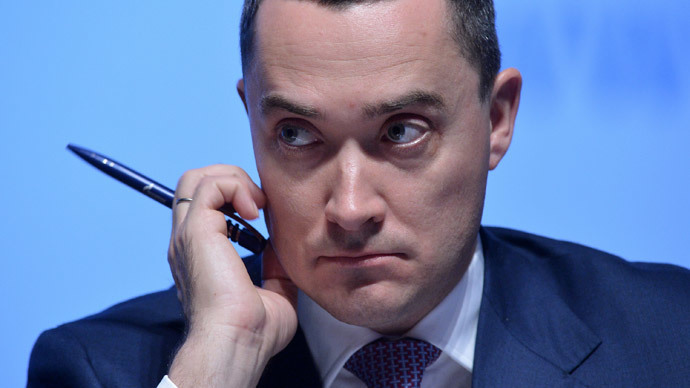 The Ukrainian energy minister also said Moscow was selling its gas to Kiev at a 15 percent premium compared to Europe. Novak says Russia could provide a gas discount to Ukraine in the future. Demchishin expressed the same hopes saying that such a discount would be a part of the so-called ‘summer package’ which is due to be agreed before April 1. Ukraine's economy is in a mess, with inflation running at 28.6 percent, and the currency the hryvnia has lost about 50 percent of its value since the beginning of the year. Naftogaz admitted last week that it's bankrupt. This appears to show Ukraine is extremely pressed for cash, with the IMF’s $17.5 billion assistance seen as key to the economy’s rescue. The new bailout package will come with strict budgetary terms and key macroeconomic indicator goals. To comply with the terms, earlier this week Ukraine’s parliament revised the budget for 2015, introducing austerity measures like a drastic cut in pensions, and the tripling of energy bills. The IMF is expected to assess Kiev’s progress on March 11, when the package could be finally sealed. Last month Ukraine's Prime Minister Arseny Yatsenyuk admitted the country is on the brink of default without assistance from the IMF. He said Ukraine was ready to stop buying Russian gas by increasing domestic oil and gas exploration and getting supplies from Europe. At the same time Europe itself gets a third of its gas demand from Russia. On Thursday Bulgarian vice premier Ivaylo Kalfin admitted that currently there is no alternative to Russian gas in Europe. Ukraine imported 900 million of cubic meters of Russian gas in February, according to Naftogaz transport subsidiary Ukrtransgaz. In January and February Ukraine bought 4.1 billion of cubic meters (bcm) of natural gas, with 2.3 billion of cubic meters coming from Europe. In the same period last year Ukraine imported 4.1 bcm of gas, exclusively from Russia. Reverse supplies from the EU, mainly from Slovakia, Hungary and Poland, have become a major source of gas for Ukraine, as in February they accounted for 1.2 bcm out of a total 2.1 bcm.